Abstract. Fast radio wave propagation predictions are of tremendous interest, e.g., for planning and optimization of cellular radio networks. We propose the use of ordinary graphics cards and specialized algorithms to achieve extremely fast predictions. 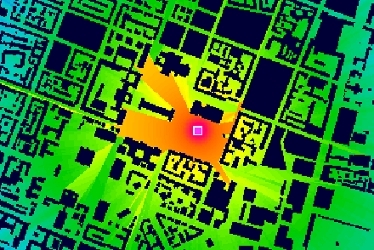 We present a ray-optical approach for wave diffraction at building edges into street canyons, exploiting the programming model of graphics cards. More than twenty predictions per second are achieved in a 7 km2 urban area with a mean squared error of less than 7 dB when compared with measurements. 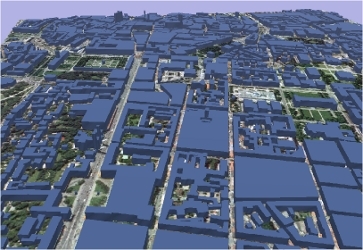 3D Building data of Munich, Germany (left) and a field strength prediction of the Edge Diffraction Model (right).